Boys bedroom Ideas – Do you find your son’s bedroom is not appealing at all? Well, maybe it times for you to refurbish it. If you think that refurbishing a bedroom is a real chore. In fact, it can be fun. 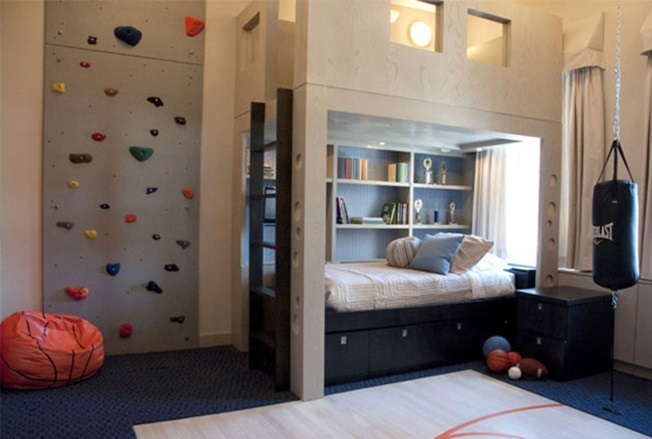 Check out these 10 cool boys bedroom ideas that your son will love so much. Your little guy is growing up. And now, he has turned into a big guy that does not want to be considered as a kid. Well, that is what he keeps saying all the time. And for a little guy that is getting to be a big guy, this bedroom will be the one that you are looking for. The black matte finish is applied to the walls, creating a masculine ambience throughout the room. A figure of Oscar, one of the characters in Shark Tales, is hung above the bed since your son is not a kid, but not an adult, either. Boys are often synonymous with challenge, speed, and physical activities. Therefore, most of them are crazy about sports cars. Maybe some of them do dream about being a racer. And you can make their dream come true. 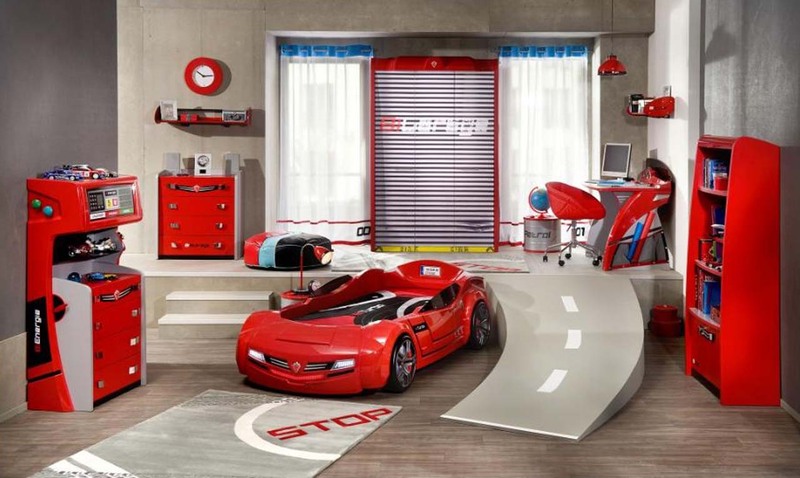 Bring the tense of racing in your kid’s bedroom by purchasing a sports car-like bed. Paint the walls light gray so that it will look like the roads. Adding a rod-like slide can enhance the theme a lot. Hint : The walls are dull with that light gray finish. But you can jazz it up by hanging road signs that can add colors to the walls. Some kids dream about joining army. They like seeing armies in actions which they think it is extremely cool. 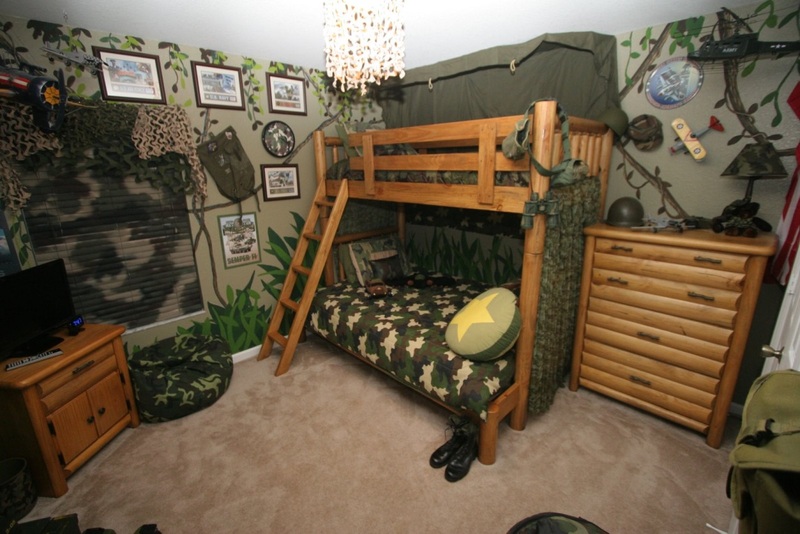 Help them immerse in their imagination by letting them have an army bedroom. Army is all about dark green, black, brown, and khaki. You only need to paint the wall using one of those colors and add the painting of vines so that the bedroom will look like a forest. A more natural look of bunk bed and drawers made of woods will accentuate the room. 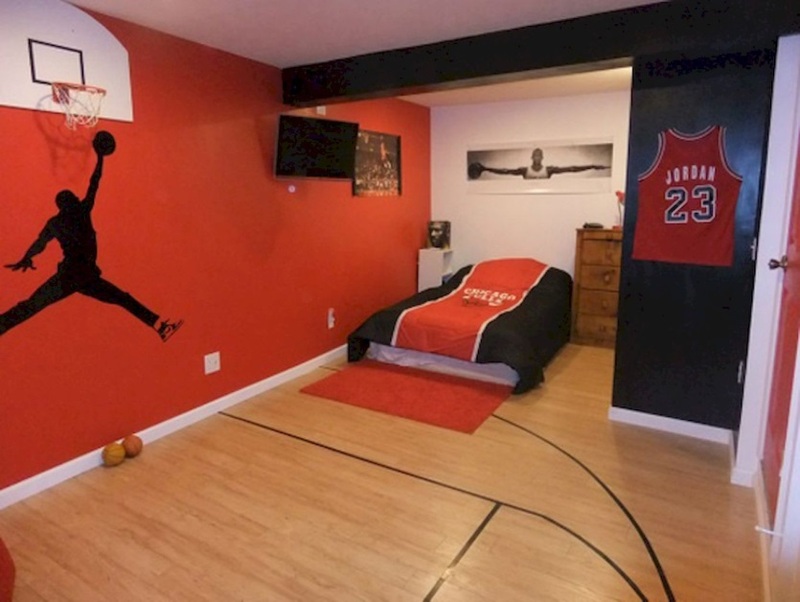 If your son is really into sports especially basket ball, and you often find him train his basketball skills, you need to build his own basketball court right inside his bedroom. If we are talking about basketball court,we are talking about highly polished wooden floor – often maple. 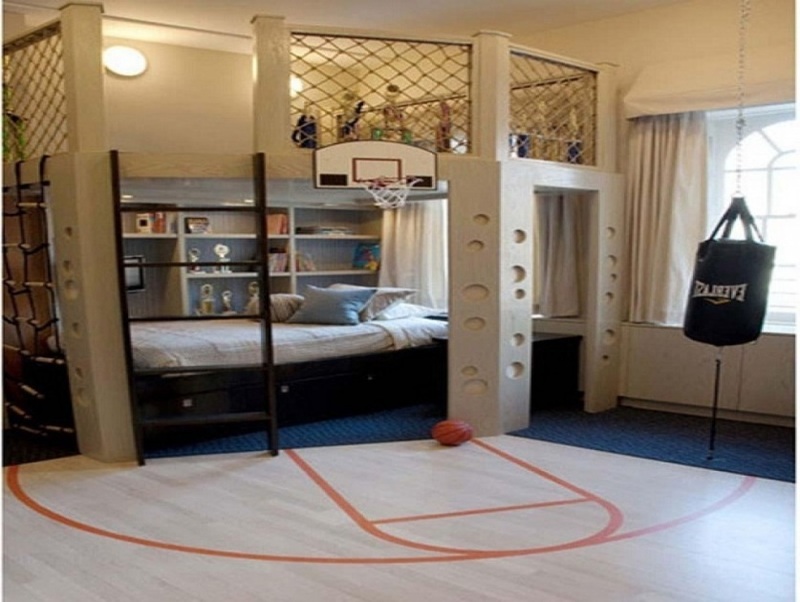 Another must-have item for a basketball theme bedroom is the basketball ring. Hang a basket ball ring so that your son can play with it when he feels cheesed off. Boys consider his bedroom as a cozy place as well as a cave for doing their stuff. Some boys enjoy staying in their bedroom while playing music or games. This bedroom will please your son a lot. All the things that he likes can be found here. Now he can play shooting the basketball ring just like Michael Jordan and train his boxing skills just like Mike Tyson. The upper part of the bunk bed can be used to play games or just relax while reading books. Kids grow well with their imagination, and so does your son. He might think that he is an astronaut that explores planets in the outer space. 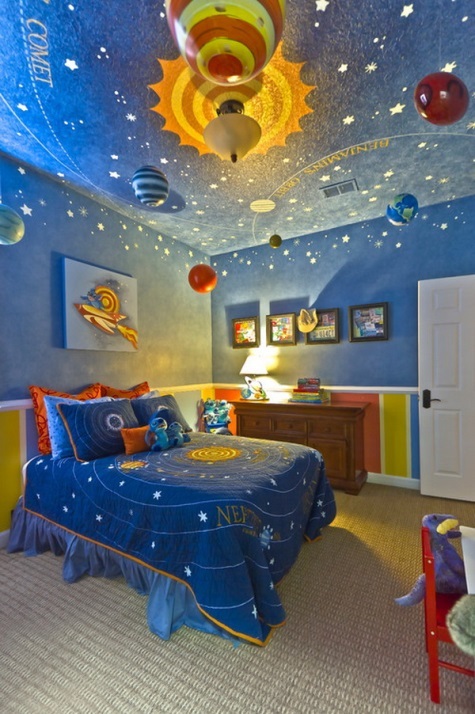 If you create his own outer space in his bedroom, he will smile exhuberantly. Paint the room dark blue so that it looks like the outer space. Add some white spots resembling the twinkling stars. Hang some balls above your son bed to denote the solar system with the lighting as the center of the system. Ahoy! Here comes the sailor! Let your kids explore their imagination by exploring and taming the ocean right from their bedroom. Is it possible? Of course, it is! What you need to do to begin your kids’ adventure is painting the walls blue, just like the color of the sea. 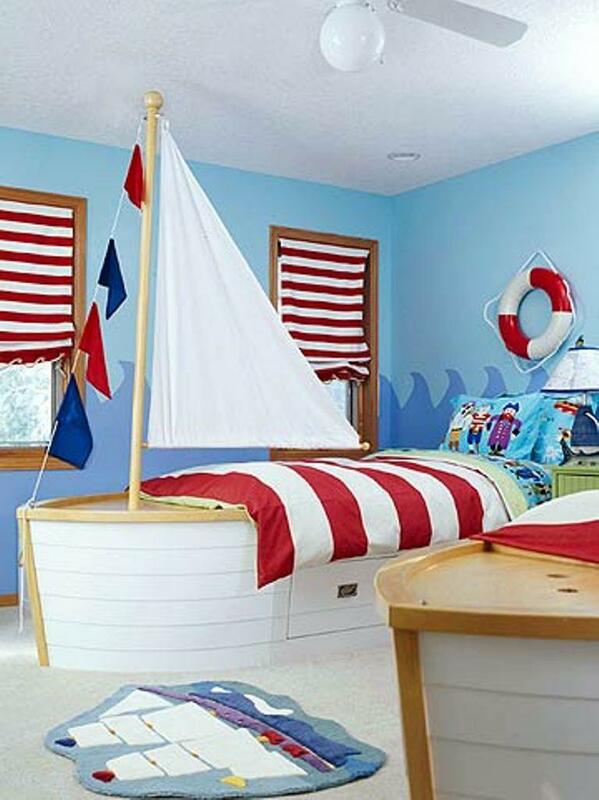 Then buy a bed that looks like a boat with sail and flags. Now your kids are ready to sail. To kick it up a notch, you can hang a lifebuoy and some figures of fish and other sea creatures. Hint : You can purchase a storage that looks like a treasure chest so that they can immerse in the adventure of pirates. Your son has grown bigger now, and he is no longer a kid with thousands of imagination. He is just a boy who enjoys spending spare time with friends or just playing the guitar in the bedroom. Unlike kids, teenagers tend to love simpler bedroom. Therefore, you can ditch the slides, car-like bed, the figures of some characters found in cartoons, and any other kids stuff. Just paint the wall black, gray, navy blue, or white because they look masculine. Hanging some silhouttes and photographs instead of cartoon figures will be a great idea because it looks more mature. But don’t overwhelm the walls with so many pictures. Let the room remain simple. Bunk bed has always been a great solution for limited space. This loft bed is such a smart solution for you kid’s bedroom since you can have all the things you have for a bedroom just in one spot. 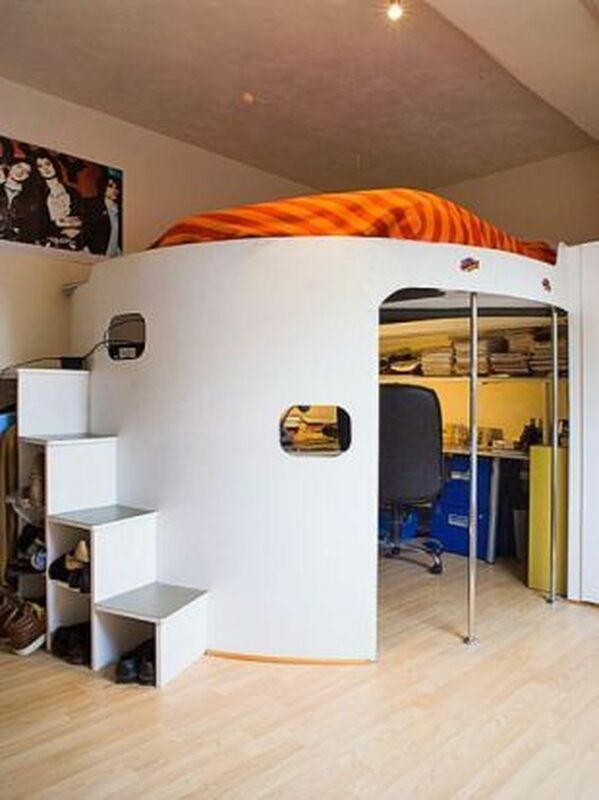 Right under the bunk bed is a space that yous kid uses as his study nook. It is a private place where he can do his homework or read books. The stairway to the upper bunk bed is made of storage cubes the he can use to store his shoes. If your son is keen on challenging activities such as wall climbing and boxing, you can create a room in which he can practice climbing. It might not be as high as the one that he usually climbs up, but it will do in a pinch. Boys are really into games, challenges, and superheroes. To find the best boys bedroom ideas that suit your kids’ style, you need to know what he loves most. Discussing it with him can be your safe bet. He might one to apply one of those 10 ideas and tweak it a bit to meet his needs well. Happy trying!